As is usual for Dante, acknowledgment of radical representational inadequacy reinforces his dedication to overcome such lack, to be “di natura buona scimia” (Inf. 29.139): a “good ape of nature”, in other words, a great mimetic artist. He seeks to find the language that will eliminate difference, traversing the space between what De vulgari eloquentia calls the rational and the sensual aspects of language, i.e., the space between the meaning and the sound, between the signified and signifier. The goal is to achieve a language that is indivisible from reality, “sì che dal fatto il dir non sia diverso” (so that my word not differ from the fact [Inf. 32.12]). Accordingly, the great cascade of metapoetic language that opens Inferno 32 celebrates the fundamental principle of Dantean mimesis: language must not differ from reality. What Dante-poet seeks is the exact opposite of Nembrot’s affliction. If Nembrot is condemned in Inferno 31 to “parlare a vòto”—to “speak emptily” or vainly (Inf. 31.79)—Dante seeks a parlare that clings to reality like a burr, annihilating all distance between the fatto (the event as it occurs) and the dir that represents it. Because we exist in time, and because our representation of life always comes into existence belatedly with respect to life itself, Dante’s quest is an impossible one: it is an “ovra inconsummabile” or “unaccomplishable task” (Par. 26.125), in the language with which Adam describes Nembrot’s attempt to build the Tower of Babel in Paradiso 26. Nonetheless, the ovra inconsummabile of creating a language in which dir is not different from fatto, a feat (“impresa” [Inf. 32.7]) undertaken with full understanding of the metaphysical reasons because of which such a goal is eternally out of reach, is without a doubt the great heroic, indeed Ulyssean, quest of the Commedia. In my opinion, Dante accomplishes this ovra inconsummabile as well as any person who has ever lived. as this fair stone is in her deeds . . . In the opening of Così nel mio parlar, the poet wants to align his parlare with the harsh atti that he seeks to describe. In the opening of Inferno 32, the poet wants to align his dir with the harsh fatti that he seeks to represent. It is the same poetic program, transferred from conjuring a scene of violent and frustrated eros in the canzone to describing the violent “fondo a tutto l’universo” (bottom of the universe [Inf. 32.8]) in Inferno. Along with the same poetic program, Dante also transfers the same stylistic modality—harsh rhymes—from the canzone to the Commedia. In Così nel mio parlar voglio esser aspro the poet desired harsh speech, a “parlar . . . aspro”; he seeks (using the very word “rima” that we find in Inf. 32.1) to find commensurate poetic expression for a reality such that “non potrebbe adequar rima” (poetry cannot render it adequately [Così nel mio parlar, 21]). più pienamente . . .
more fully . . .
nor for a tongue that cries out, "mama," "papa." O no, I’d be like a bear at play. I would take my revenge more than a thousandfold. In Inferno 32 Dante will pull hair again, and pull it violently—not this time the hair of a lady who rejects his desire, but the hair of Bocca degli Abati, the Guelph nobleman whom he here brands the arch-traitor of the battle of Montaperti (the identification of Bocca as the traitor of Montaperti is not completely confirmed). Bocca now howls in pain (“latrando lui” [Inf. 32.105]; “se tu non latri” ), as Dante once howled in desire for the stony lady: “Ohmè, perché non latra / per me, com’io per lei, nel caldo borro?” (Alas, why does she not howl / for me in the hot gorge, as I for her? [Così nel mio parlar, 59-60]). The lexicon of Così nel mio parlar continues to resonate in the language of the Ugolino episode in Inferno 32–33. Here is a sample: “impetra” (Così nel mio parlar, 3) ⇒ “sì dentro impetrai” (Inf. 33.49); “cruda” (Così nel mio parlar, 4) ⇒ “come la morte mia fu cruda” (Inf. 33.20); “rodermi” (Così nel mio parlar, 25) ⇒ “che frutti infamia al traditor ch’i’ rodo” (Inf. 33.8); “co li denti d’Amor già mi manduca” (Così nel mio parlar, 32) ⇒ “e come ’l pan per fame si manduca” (Inf. 32.127). The sin that Dante stipulates for the ninth circle of Hell is treachery: fraud practiced on those who trust us, as he defines it in Inferno 11.53. The ninth circle is thus a continuation of the eighth, which features sinners who deceived people with whom they shared no special bonds of trust. Dante has given about half the real estate of Hell to fraud, for we enter the circle of fraud in Inferno 18 and fraud persists as an organizing principle until the end of Inferno. When the travelers arrive at the fondo dell’universo, the bottom of the universe or the ninth circle, they see ice: ice so thick that if certain very large and particularly stony mountains fell upon this ice, it would not crack (verses 25-30). One of the mountains named in this passage is “Pietrapana” (from Pietra Apuana), a mountain in the Apuan Alps in Tuscany that is now called Pania della Croce. Its very name, Pietrapana, reminds us of the icy cold stony lady of the rime petrose. And indeed, as the poetic program of lowest Hell is imprinted with a rima petrosa, so too is the air, the landscape, the very “weather” of this place. The petrose are winter poems, poems that explore a love that renders the self stone-dead and ice-cold. The icy death of the rime petrose, subjective and psychological, has now been projected onto objective reality: it has been conjured as the frozen lake of Cocytus, the frozen core—the frozen heart—at the center of the universe. ice = lack of all warmth, lack of all life, lack of all love. The ninth circle features the icy coldness of death. The ice of Cocytus is maintained by a frigid wind, which (as we will learn in Inferno 34) is generated by Lucifer’s bat-like wings. A first mention of the frigid wind of lowest Hell is found in verse 75: “e io tremava ne l’etterno rezzo” (and I was trembling in the eternal breeze [Inf. 32.75]). The smooth ice of Cocytus, which the extreme cold has caused to take on the appearance of glass (“avea di vetro e non d’acqua sembiante” [it looks like glass, not water Inf. 32.24]), serves as a mirror. Camicion de’ Pazzi says to Dante, in verse 54, “Perché cotanto in noi ti specchi?”, which, literally translated, means: “Why do you so mirror yourself in us?” (Inf. 32.54). This is a lake of glass in which the self is mirrored, for the journey through Hell, which now draws to an end, is not only about recognizing evil in others: we must also recognize evil in ourselves. The ice is the home of traitors, for betrayal is human behavior that is premised on lack of love. Here in the ninth circle we find four types of betrayal (although as we shall see one type easily bleeds into another): betrayal of family, betrayal of country or party, betrayal of friends and guests, betrayal of benefactors. 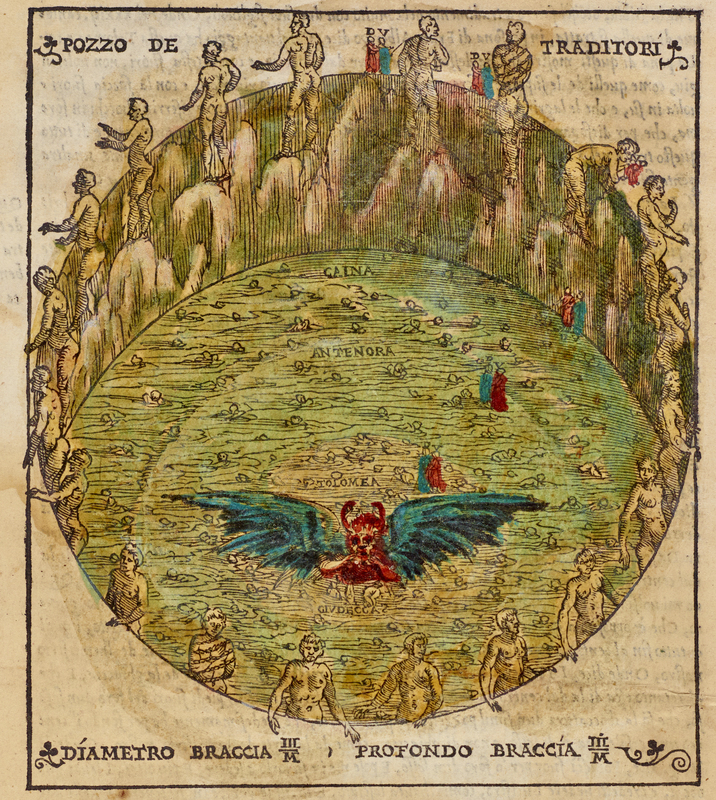 Dante imagines that the ice of Cocytus is roughly divided into four zones accordingly and that the sinners exhibit different postures in the ice according to which zone they inhabit. The sinners in lowest Hell are those who defiled the bonds of family and community that we humans hold most dear. degna più d’esser fitta in gelatina. a shade more fit to sit within this ice. The mutual hatred (based on quarrels over inheritance) of these two brothers, Napoleone and Alessandro degli Alberti, counts of Mangona, led to their killing each other. The double fratricide was followed in the next generation by the killing of Napoleone’s son, Orso, by the hand of Alessandro’s son, Alberto (Sapegno, p. 354, who cites Barbi). As the Malatesta family well demonstrates, there is not a clear demarcation between family betrayal and political betrayal. This blurring of the lines between family ties and the exercise of political power, systemic in Dante’s society, comes into focus in the episode that dominates the next canto, that of Count Ugolino della Gherardesca. There is another tidbit of Malatesta history that relates Francesca’s story to Inferno 32. In verses 122-23 of this canto, Dante presents the political traitor Tebaldello de’ Zambrasi of Faenza: “Tebaldello, / ch’aprì Faenza quando si dormia” (he who unlocked Faenza while it slept). Tebaldello’s daughter Zambrasina married the widower Gianciotto Malatesta and bore him five children after Francesca’s demise, “thus achieving the unique status of being wife of one traitor in Dante’s hell and daughter of another” (“Dante and Francesca da Rimini”, p. 19). A final point about the word “Caina” in Inferno 5.107. Whatever form of outlining or note-keeping Dante undertook in composing his intricate otherworld, he clearly had worked out at least a basic formal structure, as indicated by Francesca using the name Caina for lowest Hell way up in Inferno 5. This line not only shows that Dante had planned the structure of Hell in some detail quite a bit in advance, it also indicates that he likely understood that he was creating a text that would require commentary. The same early commentators who explain the identity of Francesca da Rimini also have the task of explaining what the word “Caina” signifies in Inf. 5.107. However, while information about the identity of Francesca da Rimini has to be imported by the commentator from outside of the text, the significance of the word “Caina” in Inf. 5.107 is entirely internal: it can only be ascertained by reading Inferno 32. By treating his own virtual reality as equally deserving of gloss as a simile drawn from Ovid or the identity of a historical character, Dante contributes to the compelling verisimilitude of his text. 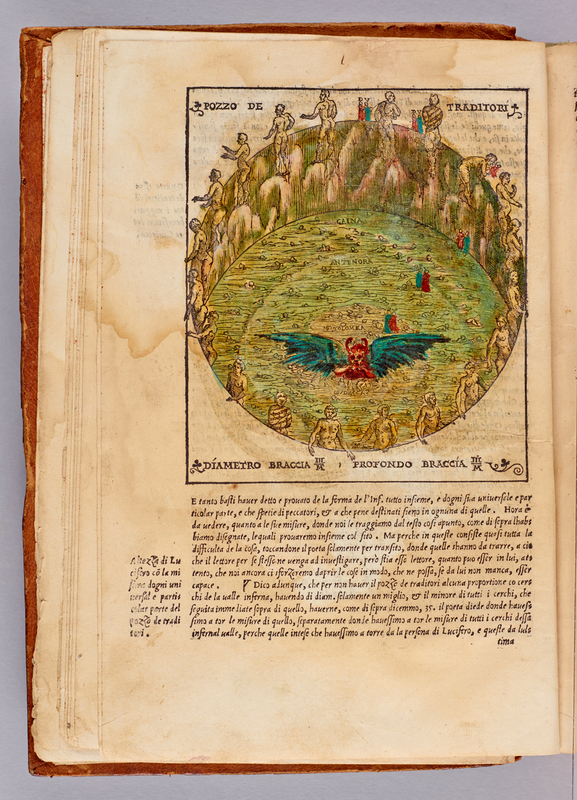 The second zone of the ninth circle, ”Antenora” (verse 88), contains political traitors, including Bocca degli Abati, a Florentine Guelph whom Dante believed betrayed his fellow Guelphs at the battle of Montaperti (1260). The Abati family is a magnate family. (See the list of Florentine magnates compiled by the historian Carol Lansing in her book The Florentine Magnates, posted in the Introduction to Inferno 10.) Bocca degli Abati’s betrayal of Florence during the battle of Montaperti—he cut off the hand of the Florentine standard-bearer—turned the tide and led to the victory of the Sienese and the Florentine Ghibellines over the Florentine Guelphs. Looking back at the chronicles of Florentine history in the Inferno that feature Montaperti—in particular Inferno 10 and Inferno 28—we see that the battle of Montaperti is like a festering wound that never heals. The exiled Florentine Ghibelline, Farinata degli Uberti of Inferno 10, led the Sienese forces to victory over their arch-rival Florence. The victory at Montaperti initiated a violent back-and-forth as Ghibellines and Guelphs exchanged power and exiled each other throughout the subsequent decades. The violence of the encounter with Bocca degli Abati reflects this terrible history: Dante suspects he is speaking to Bocca and, when Bocca refuses to reveal his name (a name that is then “betrayed” to Dante by another traitor in Inf. 32.106), the pilgrim threatens to pull out his hair (Inf. 32.97-99). The sinner who betrays Bocca is subsequently revealed by Bocca to be Buoso da Duera, who betrayed Manfredi and the Ghibelline cause: Buoso da Duera accepted a bribe from Charles of Anjou and withdrew all opposition to the passage of the French through Lombardy, thus leading to the defeat of Manfredi (Frederick II’s illegitimate son) at Benevento in 1266. The defeat of the imperial cause at the battle of Benevento is another tragic waystation. In this passage Dante offers both a Ghibelline traitor (Buoso da Duera) and a Guelph traitor (Bocca degli Abati), but his personal passionate hatred is reserved for the Guelph. The pilgrim tells Bocca that he will heap shame on him by bringing “true news” of his whereabouts back to earth: “ch’a la tua onta / io porterò di te vere novelle” (for I shall carry / true news of you, and that will bring you shame [Inf. 32.110-11]). Here Dante threatens Bocca with the very stigma of profound shame and dishonor—the “onta” discussed in the Introduction to Inferno 29—that in the Geri del Bello episode he refused to assume for himself. For Dante, the failure to perform vendetta does not merit onta, while the betrayal of one’s fellow citizens to their deaths does. Of course, the “devil” that is touching Bocca is none other than Dante, who here has “become” a devil or a minister of God’s justice, in fulfillment of the infernal mandate that “Qui vive la pietà quand’è ben morta” (Here pity lives when it is truly dead [Inf. 20.28]). At the same time, it is worth noting that Dante is here participating in the kind of quarrel that Virgilio just recently, at the end of Inferno 30, rebuked him for even watching. Perhaps, as I suggested in the Introduction to Inferno 30, Virgilio’s rebuke was a sign of the Roman poet’s limited understanding of Hell, rather than a sign of Dante’s shameful behavior. In the last section of Inferno 32, the travelers see one sinner savagely eating the skull of another, digging in his teeth, with terrible precision, “right at the place where brain is joined to nape”: “là ’ve ’l cervel s’aggiugne con la nuca” (Inf. 32.129). The pilgrim addresses the soul as one who shows his hatred for the one he eats through such a “bestial sign”: “O tu che mostri per sì bestial segno / odio sovra colui che tu ti mangi” (O you who show, with such a bestial sign, / your hatred for the one on whom you feed [Inf. 32.133-34]). This is the beginning of the encounter with Ugolino della Gherardesca, whose story dominates Inferno 33. The distortion of language that was signaled by Nembrot’s gibberish in Inferno 31 has now found its fitting rubric. Down here language is a “bestial segno” (bestial sign [Inf. 32.133]). These souls would have been better off had they been “pecore e zebe” (sheep and goats [Inf. 32.15]): now they chatter their teeth like storks (“mettendo i denti in nota di cicogna” [Inf. 32.36]) and howl like dogs (“latrando lui con gli occhi in giù raccolti” [Inf. 32.105]). Their language is bestial not because it is poorly uttered or composed; as we will see Ugolino is an accomplished rhetorician. It is bestial because it does not respect the human ties that are the reason for language’s existence: it does not respect the ties of family and community. It is not used to comfort and console. It is used—like Buoso’s and Bocca’s language in Inferno 32—to betray. 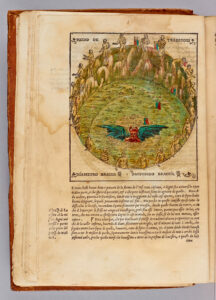 Coordinated Reading: The Undivine Comedy, pp. 93-94; Dante and Francesca da Rimini: Realpolitik, Romance, Gender”, Speculum 75 (2000): 1-28; “Dante’s Sympathy for the Other, or the Non-Stereotyping Imagination: Sexual and Racialized Others in the Commedia”, Critica del Testo 14 (2011): 177-204. 9né da lingua che chiami mamma o babbo. 12sì che dal fatto il dir non sia diverso. 15mei foste state qui pecore o zebe! 21le teste de’ fratei miseri lassi». 24avea di vetro e non d’acqua sembiante. 30non avria pur da l’orlo fatto cricchi. 36mettendo i denti in nota di cicogna. 39tra lor testimonianza si procaccia. 42che ’l pel del capo avieno insieme misto. 48le lagrime tra essi e riserrolli. 51cozzaro insieme, tanta ira li vinse. 54disse: «Perché cotanto in noi ti specchi? 57del padre loro Alberto e di lor fue. 66se tosco se’, ben sai omai chi fu. 69e aspetto Carlin che mi scagioni». 72e verrà sempre, de’ gelati guazzi. 78forte percossi ’l piè nel viso ad una. 79Piangendo mi sgridò: «Perché mi peste? 81di Montaperti, perché mi moleste?». 84poi mi farai, quantunque vorrai, fretta». 87«Qual se’ tu che così rampogni altrui?». 90sì che, se fossi vivo, troppo fora?». 93ch’io metta il nome tuo tra l’altre note». 94Ed elli a me: «Del contrario ho io brama. 96ché mal sai lusingar per questa lama!». 99o che capel qui sù non ti rimagna». 102se mille fiate in sul capo mi tomi». 106quando un altro gridò: «Che hai tu, Bocca? 108se tu non latri? qual diavol ti tocca?». 111io porterò di te vere novelle». 114di quel ch’ebbe or così la lingua pronta. 117là dove i peccatori stanno freschi”. 120di cui segò Fiorenza la gorgiera. 123ch’aprì Faenza quando si dormia». 132che quei faceva il teschio e l’altre cose. 139se quella con ch’io parlo non si secca». so that my tale not differ from the fact. better if here you had been goats or sheep! had lost the look of water and seemed glass. not even at the edge would it have creaked. whose teeth were chattering with notes like storks’. just as their eyes proclaimed their sorry hearts. the hair upon their heads had intermingled. held fast the tears and locked their lids still more. each other like two rams, such was their fury. “Why do you keep on staring so at us? belonged to them and to their father Alberto. you’re Tuscan, now you know who he has been. and always will—when I face frozen fords. I struck my foot hard in the face of one. Weeping, he chided then: “Why trample me? when someone else cried out: “What is it, Bocca? about the one whose tongue was now so quick. he had his gullet sliced right through by Florence. than this one chewed the skull and other parts. Nor for a tongue that cries Mamma and Babbo. That from the fact the word be not diverse. ‘Twere better ye had here been sheep or goats ! The semblance had of glass, and not of water. E’en at the edge ‘twould not have given a creak. Setting their teeth unto the note of storks. Among them witness of itself procures. The hair upon their heads together mingled. The tears between, and locked them up again. Butted together, so much wrath o’ercame them. Said: “Why dost thou so mirror thyself in us ? Belonged to them and to their father Albert. Well knowest thou who he was, if thou art Tuscan. And evermore will come, at frozen ponds. Weeping he growled: “Why dost thou trample me ? When cried another: “What doth ail thee, Bocca ? There where the brain is to the nape united. Than that one did the skull and the other things. Dante and Virgilio reach the ninth and lowest circle of Hell, a frozen lake of ice filled with traitors. It is ringed by classical and Biblical giants, symbolizing pride and other flaws that lead to treachery. The four rings of ice encase sinners deeper and deeper according to the severity of their treachery. In the center, the Judecca, sits Satan knee deep in ice, condemned for being the ultimate traitor to God, weeping and beating his wings in a futile attempt to free himself.